You’re all done and will immediately start earning money for Book Dash when you swipe your card at Woolies, Engen, FlightCentre, Loot.co.za, Waltons and other partner stores. 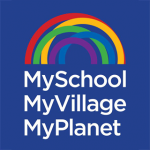 You can even link your Woolworths and MySchool card so you only need one card. If you shop online, you’ll need to add your MySchool number to your online shopping profile, or enter it when you check out. You can also just download the app and use that as your card. to follow these simple steps so we can get more bucks for books!